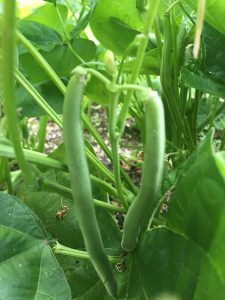 We have been harvesting a lot of veggies from our garden this summer. We certainly are eating local, organic, and from farm to table! Recently we experienced a dry spell and I was reminded of the importance of water. 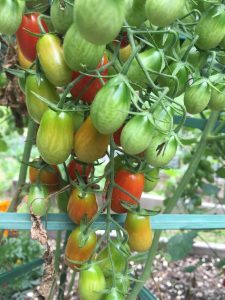 The plants weren’t affected much from the dryness, but the fruit of the plants were beginning to suffer. 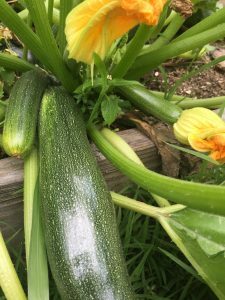 Some of the zucchini began to get yellow and shriveled at the ends, the tomatoes were small, and the spinach and kale grew slowly. While hand watering was a help, it was not as good as God-given rain! The physical body can go three to four days without water. But what about your spiritual body? How long can you survive without Living Water? Jesus was passing through Samaria when He found himself tired and weary from a long walk. His disciples went off to buy lunch while Jesus sat to rest beside a well. A Samaritan woman came to get water for her household. She was surprised when He, a Jewish man asked her, a Samaritan woman, for a drink. The Samaritan woman needed to make that trip to the well to get water, it wasn’t something she could put off, there weren’t other things that were of greater importance, her physical thirst brought her to the well that day. She came to the well prepared. She knew the well was deep and in order to get water she needed a bucket and a rope. But that day the woman learned there are two types of thirst. While she was consumed with her physical thirst, Jesus was consumed with her spiritual thirst! Jesus understood the importance of the water from the well and without it she would die in several days. But He also understood the importance of Living Water. Without Living Water the woman’s thirst for love would never be quenched, she would have no joy, and would die without hope. Jesus understands your physical thirst, but is passionate about your spiritual thirst! Jesus was fully God and fully human. Tired, weary, and thirsty from His long walk, Jesus used His physical thirst to draw this woman into a conversation that would quench her spiritual thirst! Jesus was able to look beyond the woman’s physical thirst and saw she suffered from a much deeper thirst, a thirst of her soul, that kept her looking to the affections of men, but never being satisfied. Jesus knew He was God’s gift of love to her! Jesus knew He was the Living Water that would permanently quench the thirst of her soul! When Jesus exposed the bad fruit her life was producing, the woman knew He was a prophet of God, perhaps even the Messiah. The Living Water Jesus gave her, God’s gift of love, quenched her thirst and changed her instantly! Once the Samaritan woman received the truth and drank it in, not only was the thirst of her soul quenched, but her story brought Living Water to all who lived in her town! This story is a reminder that Jesus understands your humanness. He cares about the things that you need. And it is those physical needs that can be the very things that He uses to get your attention to draw you into conversation so that He can show you the deeper needs of your soul. Jesus calls all who are thirsty to come to Him! Physical dehydration can come upon you slowly and you aren’t even aware until you experience the symptoms; increased thirst, headaches, dizziness, at which point you will do everything you need to so that you are rehydrated. It is recommended you drink at least eight 8 ounce glasses of water each day. What about Living Water? How much are you drinking each day? God’s gift to you; Jesus, the Living Water, is always available to show you the deeper thirsts of your soul. And once you know the truth and drink from Him you will be satisfied, and produce good fruit. I hope I’ve made you thirsty! 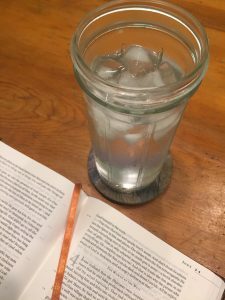 Grab a tall glass of ice water and your Bible and drink! Previous Previous post: Remember to Not Forget! Next Next post: How Persistent are You?